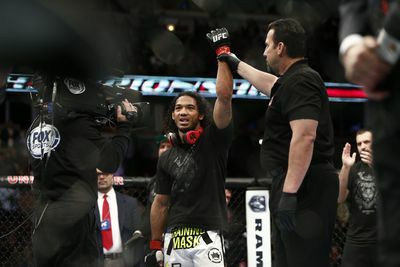 Benson Henderson had just finished up a tough win over Jorge Masvidal and he had a message for someone. Who? He didn’t say. “Was it impressive enough to warrant facing off with you?” Henderson said in the Octagon. The former UFC lightweight champion cleared up the confusion with Ariel Helwani in Monday’s edition of The MMA Hour. Henderson had no idea it was a big mystery. The man he was talking to? None other than the legendary Georges St-Pierre. There has been quite a bit of talk lately about a potential St-Pierre return. The former UFC welterweight champion — and one of the pound-for-pound best ever — said he is considering a comeback, but first could enter into a six-week training camp to see if he truly still wants to fight in the UFC.